Save 22% off the MSRP on 2" x 200' rolls of the Ergomat DSH2200BW DuraStripe DSH2200 Black/White Hazard Striping Tape (MFG Part Number: DSH2200BW) when you use our FPF041114 Coupon Code. This Featured Product Friday (FPF) promo is valid from today, April 11, 2014 through Sunday, April 13, 2014. 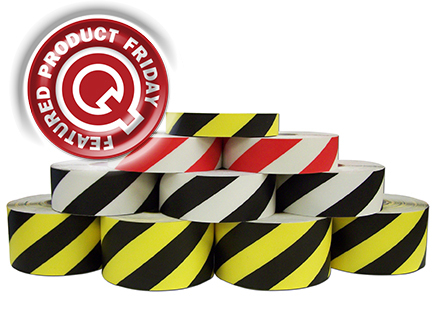 This Ergomat DuraStripe Hazard Striping Tape (Q Source SKU: T023-000108) is a 100% smear- and scuff-resistant "caution" striping perfect for alerting workers to potential workplace danger areas. Regularly listed at $199.00, but with our FPF code savings you’ll get it for just $155.00 (a savings of $44.00). While this is a 3-day limited-time price, the coupon is unlimited. Use the code as many times as you like while it is valid—and please feel free to share the code with your friends & colleagues, too. Please note: This promo is valid only at QSource.com.